Great mix of features and recording length make the Loop Core a great option if you are looking to step up from a beginner model. Nux is all but an underdog on the market of guitar effect pedals and guitar gear in general. You might’ve heard about their MG-100 multi FX processor, the JTC mini looper, their infamous Cerberus, or the Atlantic multi delay & reverb pedals so far, but today we’re reviewing the Loop Core pedal. Why is it so special and different than the others? Well, for starters, this pedal actually has a huge amount of features, and although that makes it slightly more difficult to use, it’s definitely more convenient in terms of versatility than most pedals in the ‘under $100’ range. Further on that note, though it is relatively inexpensive, it both looks and sounds big. Don't miss the other looper pedals that made our looper pedal guide. Essentially, Loop Core is more than just a looper pedal. It has integrated user memory banks, numerous drum patterns, a ridiculous recording time, the ability to record in both mono and stereo, and latency-free phrase switching. Connectivity is also great, as there are two ins and outs for two instruments. The first thing you’ll notice is the digital display on the top right corner. It shows the mode/loop which is currently active. On the right there’s the save/delete button and ‘stop modes’ button, both of which are quite self explanatory. In the very middle there are three indicators ‘rec’, ‘dub’, and ‘play’. Right next to the right-most indicator you’ll see the ‘rhythm’ button, and below it the ‘tap tempo’ button. On the lower right side there’s the Rhythm loop control knob and the phrase switching buttons. Most people describe this looper’s sound as ‘organic’, and even though it does have some ‘digitalized features’, the natural audio still manages to emerge through. Its versatility is huge, and it’s actually one of the best practice pedals you could have due to the ‘tap rhythm’ feature. Using it for live performance might be somewhat of a challenge due to the very specific feature outfit it packs, but it’s absolutely great for band practice and even studio work. There’s room for dispute whether this looper pedal is actually durable or not. Namely, the casing is hard and robust, but the onboard settings, especially the ‘rhythm/loop’ knob aren’t. Also, the LCD display doesn’t have any form of cover that could act as a shield against physical damage. Regardless, with proper maintenance and careful use it should last you for quite some time. 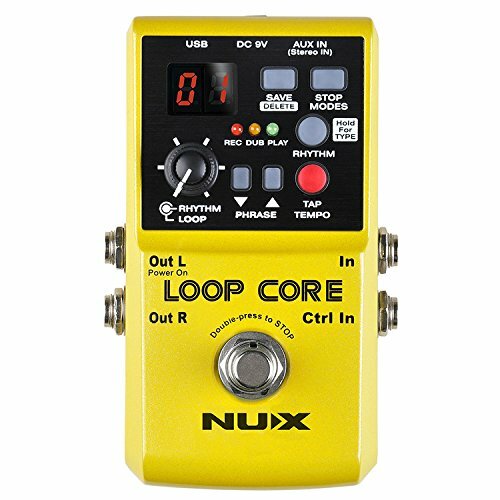 Nux Loop Core is one of the ‘Amazon’s choices’ in the ‘loop pedal’ department, and it’s pretty obvious why that is so. It’s a versatile, very natural sounding pedal that could accommodate various playing styles, but it’s sadly not flawless. Like we’ve already mentioned, standing while using this pedal might prove to be challenging. There are just so many features that it’s practically ‘reserved’ for seasoned veterans when it comes to live performances. A beginner could handle some of the most obvious features, though, but on another hand, this is not exactly the most affordable of pedals in the looper section.